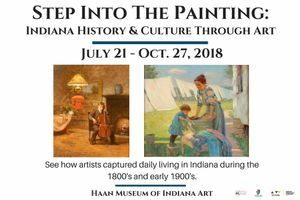 With an exciting new twist on learning about daily living in Indiana in the 1800’s and early 1900’s, the Haan Museum of Indiana Art invites guests to view art in a different way. The Museum selected paintings from its collection, featuring some of Indiana’s most important artists, showing people engaged in a variety of activities from Indiana’s past, such as feeding chickens; playing the piano and cello; the circus coming; a child helping her mother do laundry; girls carrying buckets of milk; and Indians playing the “Moccasin Game”. Historic art can teach us a lot about our past, and the exhibition at the Haan Museum provides an opportunity to feel what it was like to live in Indiana before our grandparents were born.